Growing up, Halloween was different for us that it is for kids now. We are part of Generation X, had the pleasure of growing up in the last generation before fear of “everything” and helicopter-parenting took hold. Unless you were younger than eight or nine, you trick-or-treated by yourself. There were no “limits” to distance or time. Our neighborhood had fifteen blocks full of houses ready to hand out candy, and you’ll be damn sure every kid was going to hit each one (and hit the neighborhood next to us if we could carry it). But each year my friends and I would make one particular house one of our first stops; The Romprey’s. 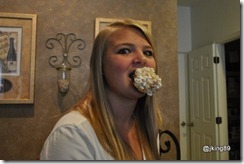 Mrs. Romprey, was known far and wide (at least within the sub 16 year old population) for her popcorn balls. They were salty, sweet and chewy. So chewy, I think by design they are made only for young people; those without dental work to risk loosing. She didn’t make them for everyone, just for the kids (and whose parents) she knew. I can almost guarantee not a year has gone by, that I have not mentioned them to my kids. 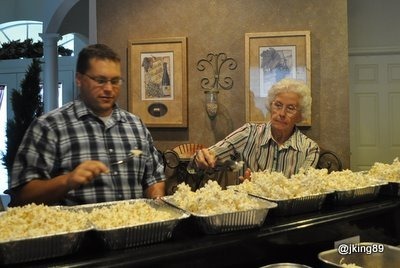 To me and my friends, Mrs. Romprey’s popcorn balls and Halloween are synonymous. But my kids have never been able to experience (yes they are an experience) them, until this year. 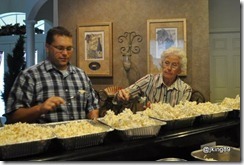 This year, our friends Richard (Mrs. Romprey’s grandson) and his wife Tabitha, organized a popcorn-ball-making extravaganza with her. 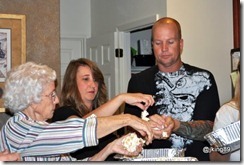 While it kind of takes a little of the magic out of it, making the popcorn balls with the kids and seeing the joy on Mrs. Romprey’s face was worth it. We learned very quickly the importance of expediency when making the balls from our first batch, as we watched the syrup harden before our eyes. But from there on, we had it. 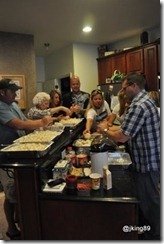 Everyone was involved, from syrup pourers, popcorn stirrers, ball shapers, and ball-baggers. We ended up making nearly 100 popcorn balls, but I suspect that between five to ten were subjected to quality control analysis during prep. 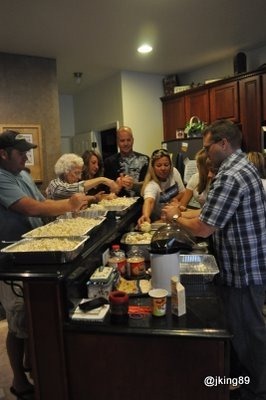 Memories like these are the glue that holds friendships and families together. I hope my kids will cherish times like these, as much as my friends and I do. 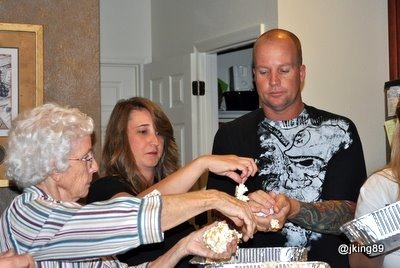 Wow, I am so happy to know that Mrs. Romprey is still with us and has passed her legendary popcorn skills onto the next generation. 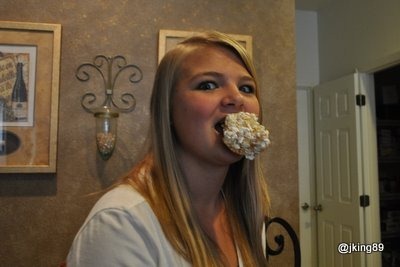 I have the exact same feelings you wrote about; how her popcorn balls were a very important part of our Halloweens past. 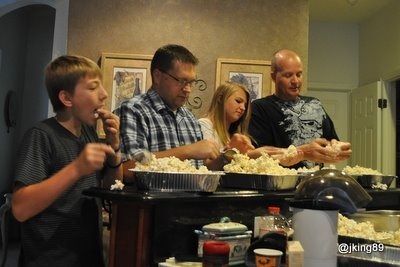 I have spoken of them to my kids too.. would love the recipe if you have it!! Thanks for putting this memory into words and sharing this with us! I’ll get the recipe typed up and send it to everyone.